Createspace Independent Publishing Platform, 9781537359830, 102pp. Over the last forty years, video games have transformed from a niche market to a multibillion-dollar industry. No longer limited to arcade parlors, video games are everywhere and are accessible at any time. Along with the popularization of video games has come a growing concern about their ability to transform those who play them into antisocial killing machines who are desensitized to violence, have no friends, and will forever live in their parents' basements. But are these fears based in reality? Over the last twenty years, psychologists, sociologists, and media scholars have been working hard to answer these questions. Until now, their findings have largely remained insulated within scientific circles and inaccessible to the general public. 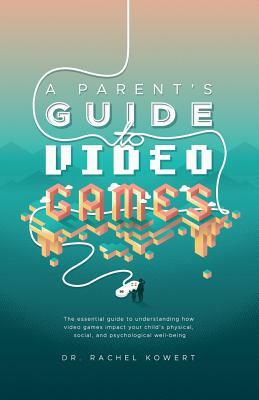 A Parent's Guide to Video Games breaks the long-standing barriers between science and society by providing the first comprehensive guide to the science behind the headlines. Drawing from the most recent research in the field of game studies, A Parent's Guide to Video Games was developed specifically to help parents better understand if, how, and why video game play can impact a child's physical, social, and psychological well-being. This includes addressing questions such as these: Will playing violent video games make my child more aggressive and more likely to commit violent crime? Is video game addiction real? If so, how do I know if my child is addicted to video games? Will video game play worsen the symptoms of attention deficit disorder (ADD)? Answers to these questions and many more are discussed inside. Armed with accurate and up-to-date scientific information, parents will begin to understand the science behind the headlines and be able to make more informed decisions for themselves and their families. Dr. Rachel Kowert is a research psychologist from Austin, Texas, with a PhD in psychology from the University of York (UK) and an MA in counseling psychology from Santa Clara University. Dr. Kowert has dedicated her career to studying video games and the gamers who love them. As a researcher, psychologist, gamer, and parent, she strives to educate other parents about the potential dangers and unique contributions that video games can bring to our everyday lives.